Extensive view of plums, plums plums…..
Coming 30th March of 2014 will be the last day for the plum trees in Ume no Koen (Plum Trees Park) in Yoshino, Oume shi, Tokyo. 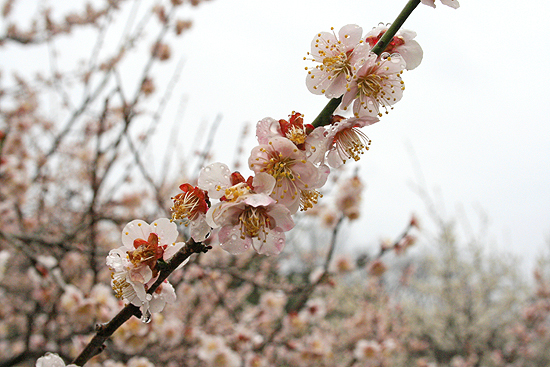 In the park, there are about 1300 plum trees, all of which will be cut down. They are infected with Plum poxW virus and there is no cure for the disease once infected. The only way to get rid of this virus, as well as avoiding the spread in other areas, is to cut down the trees. 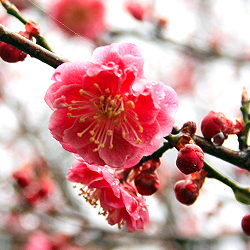 Red plum blossom of Ume no Koen. The infection was confirmed in 2010. Since then, the Ministry of Agriculture, Forestry and Fisheries and Tokyo Metropolitan Government have been cutting down the infected trees and surrounding trees. The number of the infected trees were 123 in 2010, 52 in 2011 and 39 in 2013. In total, 473 trees have been cut down to stop the spread. According to the regulation of the Ministry, complete cutting down of the trees would be the case if only over 10% of the trees in the area are infected. The ratio of the infection has never surpassed this limit in this park and only the infected trees and surrounding ones were cut down during the past 4 years. However, the regulation of the Ministry also mentions that ‘voluntarily’ refrain from replanting plum trees in the same place for three years, after the removal, is desirable. How many years would it take for this wonderful view to return again to this land….? Prominent especially under the moonlight, this white plum ‘Tsukikage’ has the same name as where her best stage should be. That must have been so terrible. We can understand that there was no better solution than going back to square one. 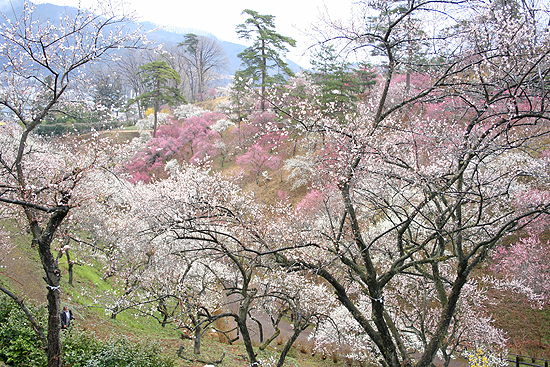 Ume no Koen (Plum Trees Park) in Oume was established in 1972. 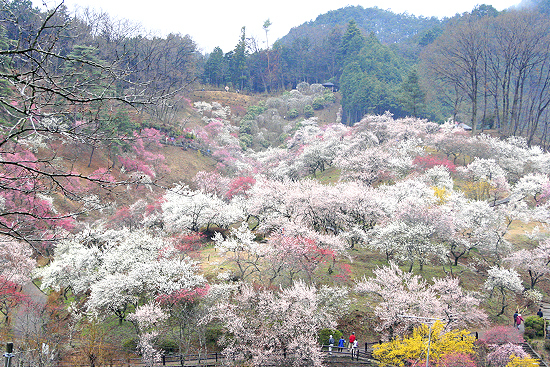 It is well known as one of the best spots for plum blossoms viewing in Japan where 60,000 -100,000 people visited to appraise the beauty of plum trees every year for 43 years. 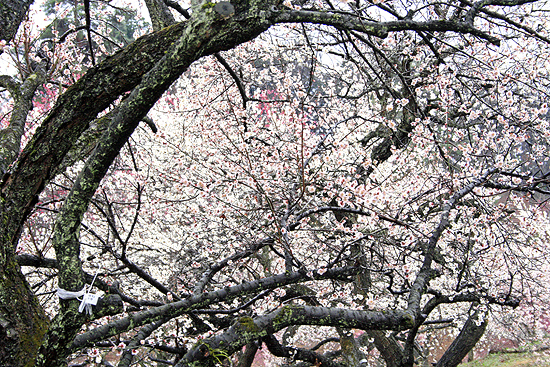 Layers of plum blossom branches send forth fragrance. All the plum trees in this park will cross the Great Divide shortly. It would have been a bad idea to introduce the tourist spot where you will not be able to visit in the near future. But because we would like more people, as many as possible, to appreciate and to see the very last splendid and beautiful blossoms of all the plum trees in this park this weekend for those who can, we are writing about it. 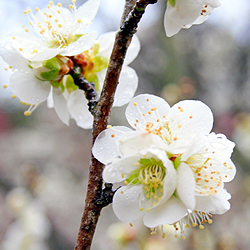 Plum that has a name of nightnigales nestle, ‘Oshuku’. The meaning of life, if there were, would be to remain in someone’s heart. Plums can’t write, so we did. We thought the trees could make their lives’ ending a little bit happier if they would remain in your heart like in ours. Take Chuo Expressway. Get off at the exit Hachioji 2nd I.C. Turn left at Sanyubashi (左入橋) and take Route 139 and keep going for about 20km. You will find temporary parking lots near the entrance of the Park. However the crowd is easily predictable and the car parks nearby will be full. Take JR Oume line and go to Oume (青梅) station and change to the train bound for Okutama (奥多摩). Get off at the second station Hinatawada (日向和田). 15 minutes walk from the Hinatawada Station. ** There are only one or two trains every hour. Though, on this weekend there are several additional temporary trains for tourists. Checking timetable below is recommended.